We are kicked that you are coming mystery camping and would like you to be prepared with all information before you head out. We've got your basics sorted. Read on. PACKING: First things first, do check out this note long before you leave. It will give you a general sense of what to pack. WARMTH: Pack warm clothes and raincoats, you'd be be prepared for whichever way the night goes. SHELTER: If you don't have a tent or other basic accessories our good friends at Campermate can sort you out with that at the site. -Just fill up the form at the end and we'll have the tents be brought over to the spot. 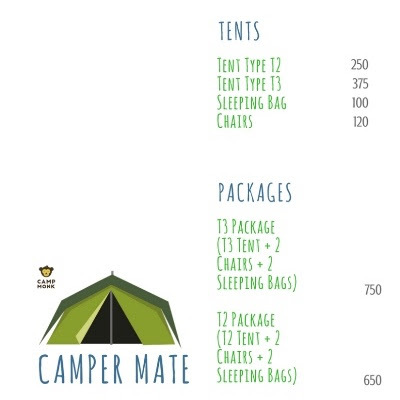 Check out the tent renting prices below. -Bags packed as per need and this note? -We'll have the location be sent to you by 10:00AM, 28th October Saturday morning. Do get there latest by 2PM on Saturday. -Don't forget that it's been raining! We'll have to make lemonade with the rain lemons, should it choose to pour down on us. -We'll add you to a WhatsApp group on Saturday morning. You can let people know if you have extra space in your car to carpool with the other campers. Looks like you are all set.